Obtaining a rounded, peaking biceps muscle is what many weightlifters and bodybuilders strive for, but often struggle to achieve. Including the 7-7-7 biceps exercise -- commonly referred to as 21s -- in your workout program can help shape and develop your entire biceps area. The 21s are an advanced training technique that uses a combination of partial repetitions and complete full-range repetitions in one set. The exercise works by performing seven repetitions in the lower range of the motion, immediately followed by seven repetitions in the upper range and seven repetitions throughout the entire range of motion. Because each range of motion is performed without any rest between totaling 21 repetitions in one set, this exercise works to improve muscular endurance. It increases blood flow to the biceps and exhausts the muscle. Grasp a dumbbell in each hand and stand or sit holding the dumbbell at arm’s length at your sides with your palms facing forward. Curl your arms upward, stopping halfway when your forearms are parallel to the floor, and then lower back down to the starting position. Complete seven repetitions of this movement and without stopping, curl the weight all the way up to your shoulders, then back down, stopping halfway. Complete seven repetitions of this partial movement. Finish with seven more repetitions of dumbbell curls using a full range of motion. The full range of motion starts with your arms fully extended and finishes with the dumbbells at your shoulders and elbows fully flexed. Keep your elbows tucked into your sides throughout the entire exercise to isolate the biceps. The 21s can also be performed using a straight barbell or EZ curl bar instead of dumbbells to add variety to your training program. An example of 21s using an EZ curl bar might be performing one set with hands positioned on the bar's inner grips, which isolates the long or outer head of the biceps brachii. On your second set, position your hands on the outer grips of the bar to focus more on the short or inner head of your biceps. Because 21s will thoroughly fatigue the biceps muscle, they are best performed at the end of your routine. 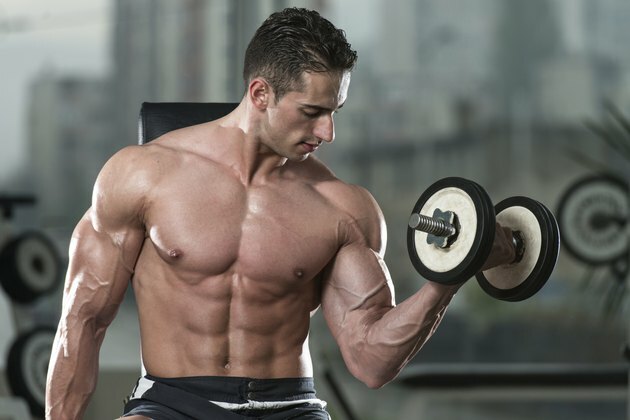 A sample biceps workout might be completing four sets of barbell curls for six to eight repetitions, followed by three sets of eight to 12 repetitions of the incline dumbbell curls, cable curls and barbell preacher curls. After exhausting your muscles with the other exercises, conclude your workout with one or two sets of 21s, using either dumbbells or barbells. Keep rest periods between sets to 60 seconds or less.